For VMworld, the AMD is launching a new virtual desktop infrastructure (VDI) solutions. 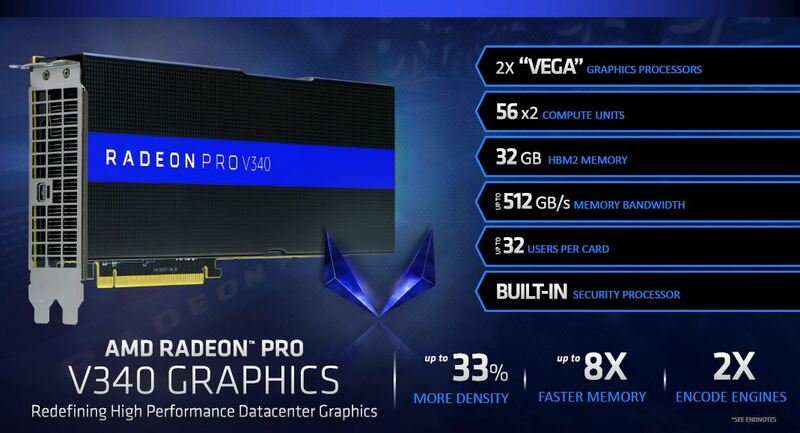 The AMD Radeon Pro V340 uses two Vega architecture GPUs with a total of 32GB of onboard memory to support a multitude of users. We have known this is coming for some time, and have a few “not in the press release” details to share. The AMD Radeon Pro V340 is intended for enterprise VDI, desktop as a service (DaaS) and cloud gaming workloads. The card itself is comprised of two Vega 56 style GPUs, each with 16GB of HMB2 memory giving each card a total of 32GB of HBM2 memory, with ECC, onboard. This is higher-end GPU memory than NVIDIA’s GDDR5(X) memory. Using SR-IOV based virtualization, these cards support up to 32x 1GB virtual desktops. Software support is focused on VMware ESXi and vSphere. We would have liked to have seen Citrix Xen, Windows Server, and Linux (KVM) supported as well. The guest OS is focused on Windows but we hope this includes Linux soon. 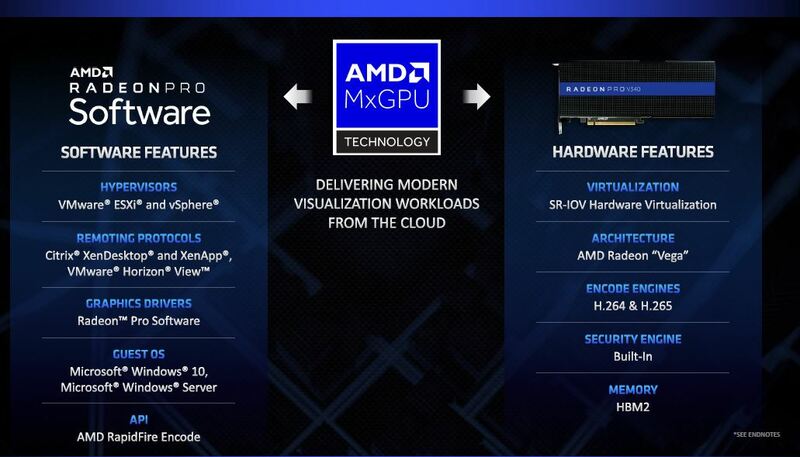 Using AMD’s MxGPU technology and SR-IOV based hardware virtualization, AMD is able to virtualize graphics without having to utilize extra virtualization drivers in the hypervisor like NVIDIA uses. That approach also means that AMD is able to utilize the standard Radeon Pro driver and does not have the driver checks like NVIDIA GRID. 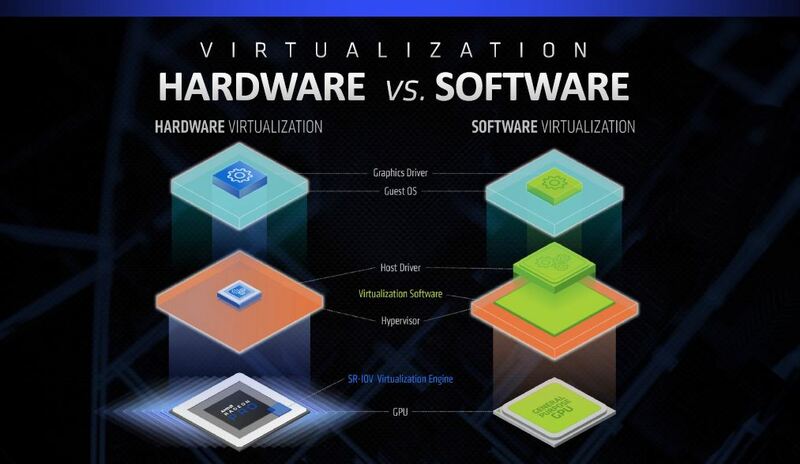 This has major impacts on cost as AMD currently does not have an NVIDIA GRID license model for GPU virtualization. 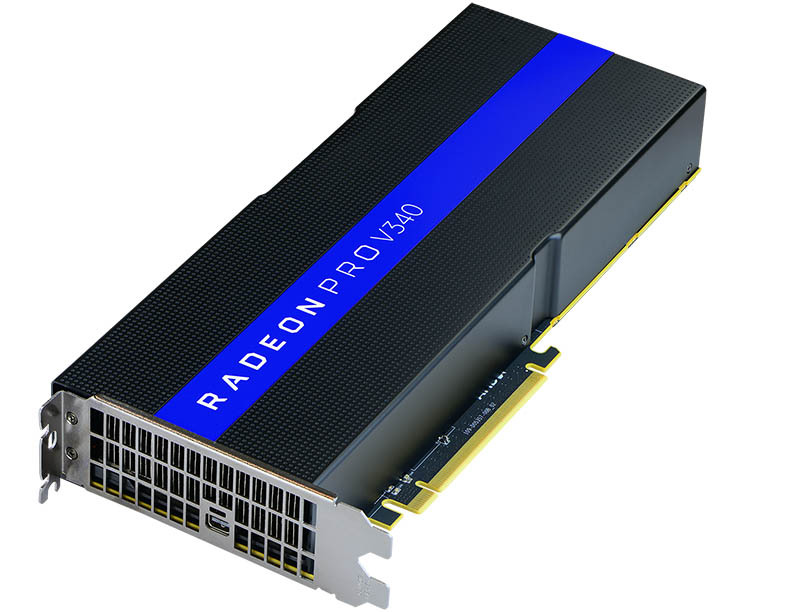 The AMD Radeon Pro V340 utilizes two 56 compute unit Vega GPUs for a total of 112 on the card. Each GPU has 16GB of HBM2 memory for a total of 32GB on the card. 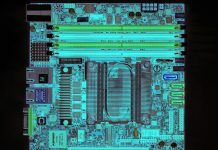 AMD seems to be using a Microsemi SmartFusion2 ARM/ FPGA SoC as the security processor + a 48 port PCIe switch to help manage the complex infrastructure. We cannot share the photo, but the Microsemi SmartFusion2 is on the back middle of the PCB. 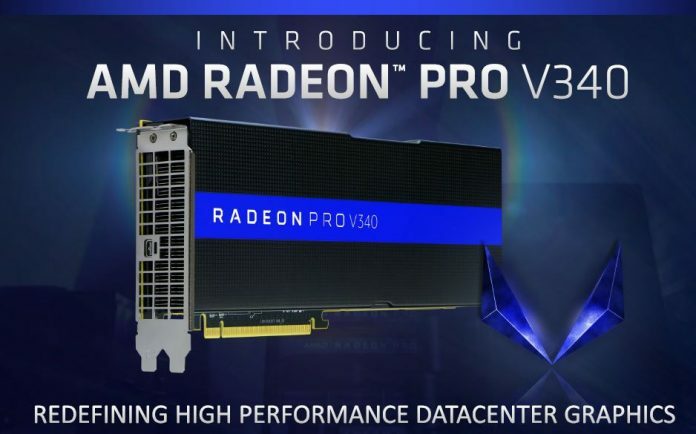 The AMD Radeon Pro V340 graphics card is expected to be available in Q4 2018 from through the company’s system partners. Any specs on compute power FP32 and/or clockspeed? Wither ROCm? It ought to make a nice shared compute card! So this replaces the Firepro S7150X2 which was based on dual 28nm Fury Nano cards IIRC. Anyone recall the TDP on the S7150X2? 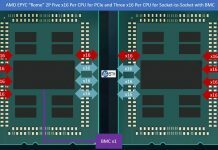 There is little if any reason to trust this new product, given the current leadership at AMD, to work as marketed for AMD and yet to acknowledge, produced and knowingly released to manufacture a premature and defective COTs, Vega Frontier Ed. product relative to 4k display functions (constantly crashing on Intel CPU motherboard platforms, not a device driver problem or would have been remedied, but hardware). Afterwards AMD and ultimately a CEO decision being that the CEO presented the Vega Frontier Ed. as a FLAG SHIP product, callously left and to this day, the failing product and betrayed customers hanging in the dysfunctional state. I suspect AMD does not have a COTs version of the Vega Frontier Ed. they can present which is stable in 4K while operating from an Intel CPU motherboard (e.g. workstation product lines). AMD and per their collective actions appearing to be selfishly limited in interest to just the initial sale, (AMD not respecting American social norms and performance expectations from products and businesses), and not how the product is functioning with singular customers or their long term ownership experience of the product, to not projecting respect by failing to provide from the start, a fully viable product as advertised. AMD abusing each customer such as myself (x3), to include seeking to impose out of country warranty processes to discourage fulfillment if not illegal in the USA, by replacing defective boards with simply another defective board being that the principle 4k defect appears from serial numbers to be systemic within the entire Vega Frontier Ed. Product. The dysfunction with the product then further aggravated by “stock price chasing” AMD having ceased sincere efforts to correct the hardware issue surrounding the product, it being a costly design error for AMD to correct appropriately and to which a defective product that is still shamelessly being marketed in the USA as a viable 4k solution and misrepresentation. I would penalize AMD and non American mindset company, since AMD and willfully, does not respect American business practices and consumers, AMD and knowingly, seaming to push the boundaries of legality. To make matters worse, since AMD knows and well that they have no suitable replacement products to provide customers for warranty, the warranty process itself being incompetent thus disingenuous, is an act of calculated misrepresentation, if not deception, thus fraud. 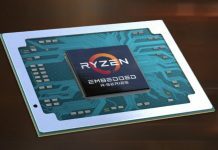 With increasingly reduced product cycles, manufactures like AMD are abusing if not exploiting the excuse of no product availability prior to warranty expiration and for products such as the Vega Frontier Ed. that out the door, fail to perform as marketed. With consumer protection in this product sector being essentially nonexistent, only to have the product intentionally not remedied, yet kept in the supply chain as viable, is either engineer fraud or incompetence and indication that regulators hired to protect citizens are not hired based on merit, are conflicted nor best. A very happy user of 2 Vega FE’s in our TR1950x workstation and 1 Vega FE in on of our i7-3960x workstation. @Jobu999 150w for S7150 and 265w for S7150x2. Sizing wise this is a drop-in replacement based on Vega for the S7150x2. This should carry a noticeable performance improvement (2x vram, gddr5x vs gddr5, and h.265 support) but yields no VDI client density improvement over the previous generation.